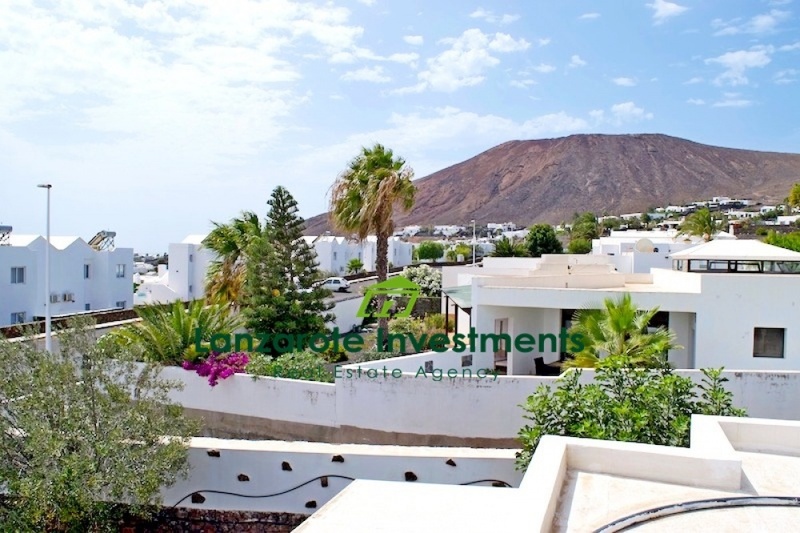 An extremely attractive detached, traditional style, 3 bedroom villa in a quiet location on an established urbanisation, with a separate studio apartment which is accessed from the garden. The secluded property is enclosed by volcanic stone walls, oﬀering total privacy around the good-sized swimming pool and surrounding terraces and gardens. The villa has been maintained to a very high standard, and has an alarm system installed and air-conditioning throughout, together with shutters and mosquito nets on all windows. An extensive terrace, complete with brick BBQ area, runs along the front of the property and overlooks the large mature gardens, with views across to Montaña Roja. The spacious and inviting lounge leads to a formal dining area. There is a fully ﬁtted and equipped kitchen/breakfast room, a utility room, and separate store room. Next to the kitchen is an informal dining area with patio doors onto the terrace. The master bedroom has ﬁtted wardrobes and an en-suite bathroom, complete with a walk-in shower and sunken corner bath. There are two further double bedrooms, again with ﬁtted wardrobes, and another bathroom with a bath. A separate studio apartment is situated within the gardens and contains a sitting area, small kitchen, shower room, and double bedroom upstairs. There is a single garage, a car port, and parking for a further vehicle. Owners also have access to the community swimming pool. The property is being sold fully furnished.